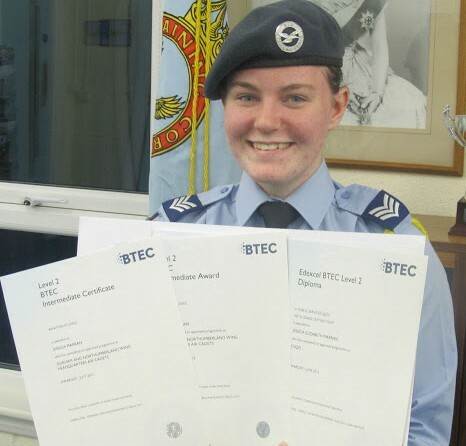 Aside from all the great experiences and new skills you’ll gain as an air cadet, you can also take away real qualifications that will set you apart from the crowd when you head to university or begin your chosen career. For starters there’s the Duke of Edinburgh Award that employers everywhere recognise as a great achievement. You can take on the challenge as part of your adventurous training, working your way up through the levels all the way to Gold – something to be really proud of. Leadership training, where you can really prove your worth as leader – a skill that will build your confidence and your ability to deal with different kinds of people. If you can handle it you could get to the Junior Leaders course – it’s gruelling but what you get out of it will be invaluable to you for the rest of your life. .
BTECs are always popular and a widely recognised qualification – more than 4,000 cadets have registered for the First Diploma in Public Services and over 6,000 have signed up for the First Diploma in Aviation Studies. There’s also the increasingly popular First Diploma in Performing Arts (Music) for budding musicians. First Aid is another essential skill you can pick up – train in this important area and you may be awarded a certificate from St Johns Ambulance. If those skills were called upon you could make all the difference in a life or death situation. City & Guilds – cadets can also benefit from certain vocational qualifications in management, as can our volunteers. If you are interesting joining 861 Squadron as a cadet, you need to be aged 12 to 17 years old. If you are 12 years old, you must be in Year 8 at school. We Parade every Monday and Thursday, 7.00-9.30pm. To join, attend the Squadron on a Parade Night with your parent/guardian and we will show you around the Squadron and tell you about how the Air Cadets could benefit you!